My wife and I suspect that Arya will grow up to love reading. She already squirms excitedly at the beginning of book time and she is clearly focused on the children’s books we read to her. But we are still looking for anything that will encourage a love of books (as opposed to, say, television or video games). The book, Book! 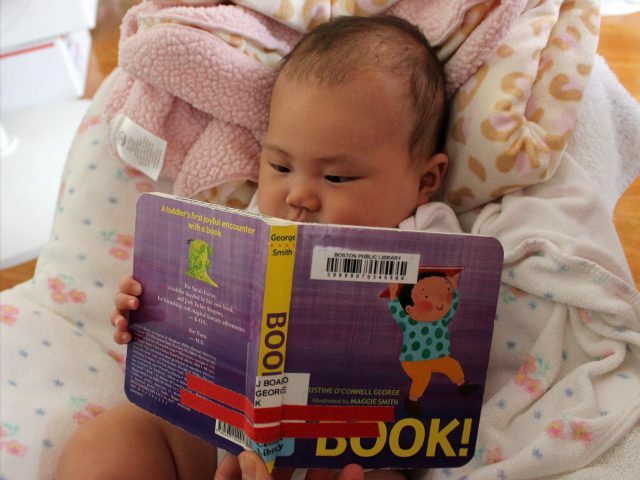 by Kristine O’Connell George, is one small way to reinforce baby’s desire to read books. As suggested by its title, Book! is about a young boy’s delight at receiving a book as a present. He rips off the wrapping paper excitedly in the first pages, carries the book around during the day, and finally goes to bed with his book at night. The story relies on more text than most books aimed at young children. Each pair of pages contains an average of one sentence with some pages having more than a dozen words. Vocabulary remains simple and the short words are a good fit for young readers. The illustrations center around the ruddy-cheek little boy and his book. Each pair of pages has a different color background with an image of the boy and his book interacting with the world. Arya particularly liked pages where the boy’s face was clearly visible. I liked the page of the older boy showing his book to his younger brother. Book! is a cute children’s book that teaches little ones that books can be wonderful, prized possessions. I don’t think my daughter will be sleeping next to any books in the future, but I do hope she appreciates a good book as much as the little boy in the story. This book makes a great addition to a beginning reader’s library. Kristine O’Connell George describes herself primarily as a children’s poet on her personal website: http://www.kristinegeorge.com. George has a full list of her published work as well as tips on teaching poetry and additional links on children’s poetry. The illustrator, Maggie Smith, also has a personal website: http://www.maggiebooks.com. Smith details her dozens of children’s books as well as links to her personal blog and art gallery. Book! costs (including shipping) $5.95 new and $3.28 used from Amazon.